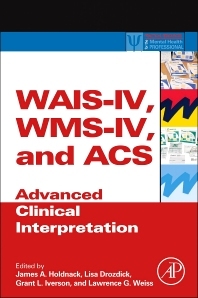 This book provides users of the Wechsler Adult Intelligence Scale (WAIS-IV) with information on applying the WAIS-IV, including additional indexes and information regarding use in special populations for advanced clinical use and interpretation. The book offers sophisticated users of the WAIS-IV and Wechsler Memory Scale (WMS-IV) guidelines on how to enhance the clinical applicability of these tests. New social cognition measures found in the ACS are also presented. The second part focuses on applying the topics in the first section to specific clinical conditions, including recommended protocols for specific clientele (e.g. using demographically adjusted norms when evaluating individuals with brain injury). Common clinical conditions are discussed, including Alzheimer’s disease, mild cognitive impairment, traumatic brain injury, and more. Each chapter provides case examples applying all three test batteries and using report examples as they are obtained from the scoring assistant. Finally, the use of the WAIS-IV/WMS-IV and the ACS in forensic settings is presented. Lawrence G. Weiss, PhD is Vice President of Test Development for Pearson Clinical Assessment. He oversees a department of 150 professionals and is responsible for all research and test development activities related to the company’s psychological, educational, speech, language, and occupational therapy assessment products as well as post college admissions tests. He also advises on test development activities for the company’s international business partners around the globe including Pearson Clinical Assessment offices in the United Kingdom, Australia, Canada, France, Germany, The Netherlands, India, China, Spain, and Brazil. Some of his books have been translated into Spanish, Japanese, and Korean. In addition, he has authored or coauthored approximately 30 journal articles, 12 technical reports, and 10 other book chapters. Dr. Weiss holds a PhD degree in industrial and organizational psychology from Texas A&M University, and a master’s degree in clinical psychology from Trinity University. He lives in San Antonio, Texas, with his wife of 28 years, Judy Ann. The Weiss’ have two adult sons.